Use the My Account page to view and edit information about your user account. 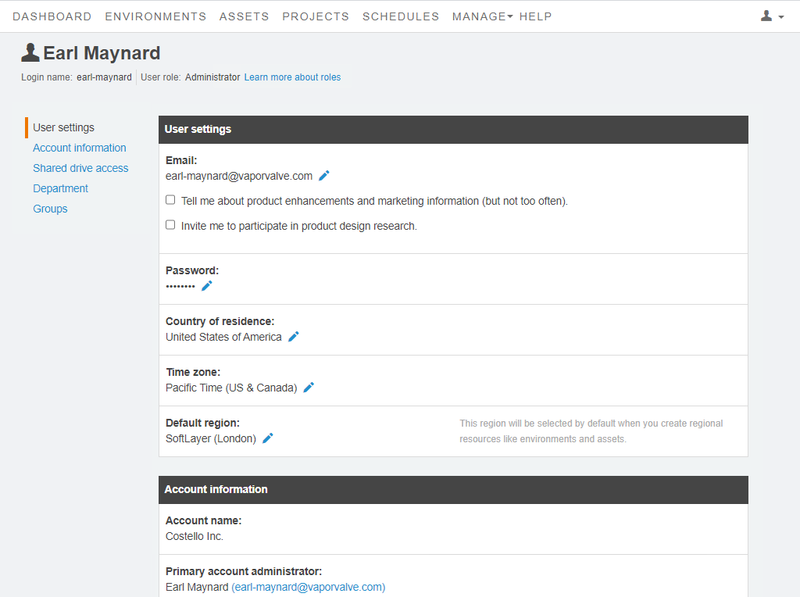 You can view and edit information about your user account from the My Account page. To access this page, click (Go to your account) in the top toolbar of any page. User name The first and last name of the signed in user. Login name The name you use to sign into https://cloud.skytap.com. User role The level of access you have in Skytap; for more information about user roles, see User roles and access permissions. This information is read-only. Contact your account administrator to make changes. Email The email address used for product notifications from https://cloud.skytap.com Click to change your email address. Click Manage your marketing email preferences to update your marketing email preferences. You will continue to receive usage notification emails or emails when certain actions complete (for example: importing VMs, or copying an environment or template to another region). Password Your current password Click and follow the prompts to change your password. Your password must meet the minimum requirements set by your account administrator. Country of residence The country you live in. This setting does not affect the time zone associate with your account activity. Click to change this value. Time zone The time zone associated with your Skytap activities (such as project creation time). This does not affect the time zones that your VMs are in. Click to change the time zone. Default region The default region for new environments, VM imports, asset uploads, new VPNs, and new public IP addresses. Click to change the default region. Account name The name given to the account for your organization. 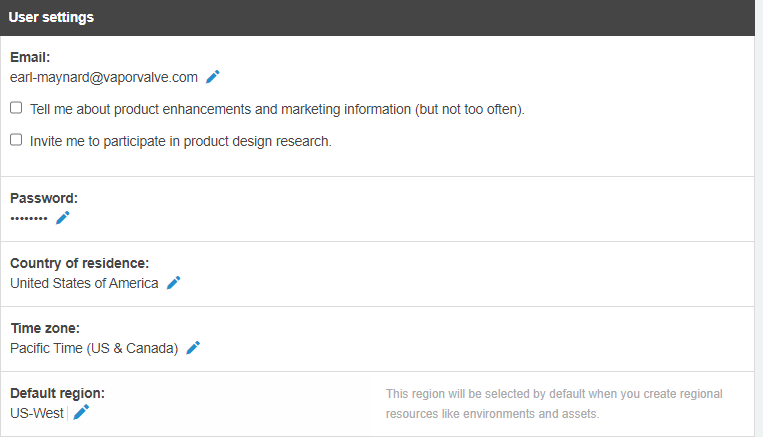 Include the account name if you submit a support case or product request. N/A; this field is managed by Skytap. Primary account administrator The person at your company or organization who is responsible for account-wide settings and controls, such as account limits and quotas. N/A; this field is managed by Skytap. Notifications A list of your current usage notifications Click Edit my notifications. For more information, see Monitoring your usage with email notifications. API security token (select accounts) The API security token. This number is used in place of your password during API requests. The API security token is hidden by default. Click Show security token to display it. Contact your account administrator to enable security tokens for your account. To reset your API security token by generating a new number, click Reset. Shared drive FTP (select users) The region, address, user name, and passwords for any shared drive accounts you have access to; for more information about using the shared drive, see Adding and sharing files with the shared drive. This information is read-only. Contact your account administrator to enable shared drive access or have these credentials changed. You can belong to only one department. Groups A list of the groups you belong to; group membership is managed by your account administrator. You can click the name of a group to learn more about it.